The Super Mario 64 A Button Challenge asks players to collect stars without ever pressing the A button, meaning Mario can’t jump. Instead, challengers use a variety of glitches and tricks. One recently discovered glitch involves waiting for three days to get a platform to the right height, allowing players to complete the game without ever jumping. The tricks employed in the A Press Challenge are some of the most intricate in any game. Most of these tricks involve intense mathematics and a great deal of time. For instance, in order to collect a specific power star in Hazy Maze Cave, the player needs to trap Mario in a particular position that lets him build up speed without moving. After 12 hours, the player has enough speed to move Mario up specific slopes and into a pre-positioned enemy in order to claim the star. Recently, a glitch was discovered in the level Bowser in the Fire Sea that allowed platforms to rise to a specific position. After waiting for three days, the platform reaches a spot that allows players to skip part of the level. As outlined in the above video by bad_boot, the glitch was discovered by a player named Andru while playing on the Wii Virtual Console version of the game. After leaving the game idle, he returned to find that a set of platforms had risen above their position in the lava. 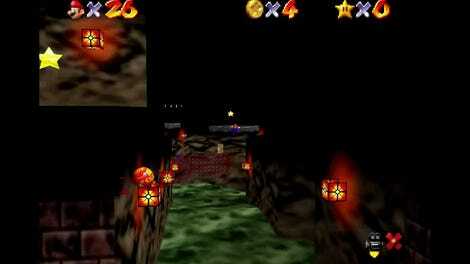 In Bowser in the Fire Sea, there is a small platform that normally requires the player to climb a pole to reach. To get off the pole, the player needs to press the A button and jump off. If these platforms could get high enough, a player would be able to skip the pole. 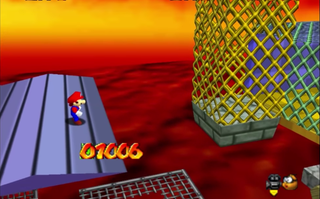 Super Mario 64 uses floating point numbers to track the position of various objects in real time, including the height of certain platforms. The Nintendo 64 version always rounds that value to a valid number even if the calculation isn’t necessarily correct. An error in the Wii Virtual Console version rounds “towards zero,” meaning that the error is never corrected. This causes the platforms to move upwards towards a height value of zero, which is above where they initially start. They move up at a very slow pace that gets ever slower as time goes on. If a player is willing to ride the platform long enough—originally estimated to take eight days but closer to three days—they avoid their dreaded A press. Since Andru discovered the glitch, players have been trying to incorporate it into their challenge runs. Last week, a tool assisted version of a zero A Press Any% speedrun—a type of gameplay run that completes the game as fast as possible through whatever means—was completed by a player named dane_bou using a Wii VC emulator. It was proof that the trick could be used to in a run that completed the game without any A presses, a monumental feat. But it asks the question: could someone do this in real time? The answer is yes and no. Last night, a player named Ethan White attempted the trick after starting their wait in Bowser in the Fire Sea on May 27th. When the time came to attempt to slide kick from the glitched platform, he missed his target and fell. We’ll just have to wait another three days for someone to pull off this awesome trick.